Happy World Vegetarian Day, Everyone! The non-profit North American Vegetarian Society (NAVS) declared October 1st World Vegetarian Day in 1977 as “an annual celebration to promote the joy, compassion and life-enhancing possibilities of vegetarianism.” I like that! As if this day isn’t awesome enough, it also kicks off Vegetarian Awareness Month. Now’s the perfect time to go veg. Try it for a day, a week or even the whole month. 1,800 to 2,500 gallons of water go into a single pound of beef and 40 calories of fossil fuel energy go into every calorie of feed lot beef. Cutting out meat just 1 day a week, like on Meat-Free Mondays, eliminates your meat consumption by 15%, which can positively impact animals, your health and the environment. Cook a vegetarian or vegan meal. Browse a veg food blog, such as The Lunchbox Bunch, The Post Punk Kitchen, Luminous Vegans, By Any Greens Necessary, JL Goes Vegan, Namely Marly, Happy Herbivore and Vegan in the Sun. Try eating a meatless meal once a week or try eating all meatless meals before 6pm. Here are some tips on going vegetarian or vegan, more tips on going vegan, and stocking the vegan pantry to get you started. Flip through a vegetarian magazine such as VegNews, Vegetarian Times, Vegetarian Living or Laika. Read a book about animals, vegetarianism or veganism, such as Vegan Main Street, The Ethics of What We Eat, 30-Day Vegan Challenge, The Face on Your Plate, Eating Animals, Why We Love Dogs, Eat Pigs and Wear Cows or When Elephants Weep. 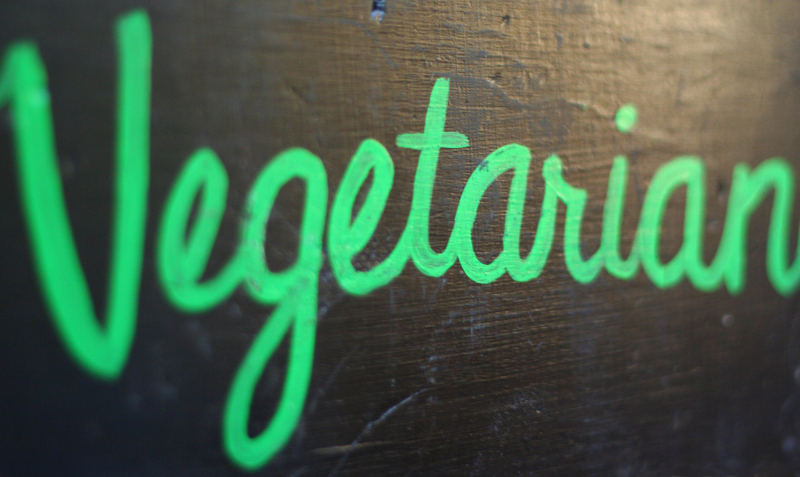 Eat at a vegetarian or vegan restaurant. Check out Happy Cow for suggestions in your city or town. Watch a veg-friendly or food film, such as Blackfish, Forks Over Knives, The Cove, Food Inc., Earthlings, Super Size Me, FRESH or Vegucated. Listen to a vegan podcast, such as Our Hen House or Food for Thought. Hug an animal. If you can, visit an animal sanctuary. How will YOU celebrate World Vegetarian Day and Vegetarian Awareness Month? Tell me in the comments! Tags: vegan, Veganism, vegetarian, Vegetarian Awareness Month, Vegetarianism, World Vegetarian Day. Bookmark the permalink.